Situated along the Jalan Raja Laut, The Plaza Hotel Kuala Lumpur is a five-minute walk from Sultan Ismail Light Rail station. This three-star hotel offers easy access to major establishments in Kuala Lumpur, and is a five-minute drive to the iconic Petronas Towers. 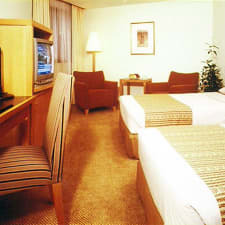 All non-smoking rooms are fully equipped with air conditioning. Each features a satellite TV, free Wi-Fi, mini-fridge, coffee/tea makers, safe deposit boxes, and bathroom with hairdryer. Additionally, suites are furnished with couches and kitchenettes. The Plaza Hotel Kuala Lumpur highlights a triple split-level car park. Furthermore, special services such as dry-cleaning & laundry, and babysitting assistance are available upon request. Complimentary breakfast is offered daily. Pago Pago Café offers a variety of scrumptious food for breakfast buffet, business luncheon, and dinner while Piano Bistro is perfect for afternoon snacks and drinks. Within a 15-minute walk from the hotel, guests can reach the Jalan Tuanku Abdul Rahman and LRT station. Set near Kuala Lumpur's Central Business District, a highly accessible location for both business and leisure travellers is guaranteed! In addition, guests noted that the hotel has easy access to fast food restaurants, shopping malls, and public transportation. The Plaza Hotel Kuala Lumpur has an awesome group of well-trained staff who are friendly yet very professional, according to many guests. The staff is willing to guide you with your planned trips along the city. Moreover, staffs are well reviewed on being extremely helpful and their willingness to offer great service. Rooms are very spacious. Guests noted that even the standard size room for two persons is quite big, and offers great classic views of the metropolis. The rooms are perfect not just for big groups for there's plenty of room to store travel luggage, but also for those who are scared of confined places. Some of the guests complained about having dirty toilets or damaged bathroom sinks. Thus, guests are advised to request the management to improve the overall maintenance and disinfect the bathrooms more effectively. Uneasy stench of blankets and rooms full of small cockroaches and mosquitoes are mostly the negative reviews noted by guests. Moreover, the blankets used within the rooms are quite old and itchy. You can request a change of sheets, or most likely a room upgrade when you experience this issue. The noise that many guests complained about is mostly associated with the other commercial establishments present within the area, as well as the large number of public road transportation. Therefore, make sure your room is not facing one of the busiest roads, the famous Chow Kit Road.